Today’s brief proceedings in the Iraqi parliament made it clear that it was indeed the objections of the Iraqi elections commission (IHEC), supported by UNAMI and the Kurds (who boycotted), that prevented a vote on the elections law. Meanwhile, the legal committee came up with two more alternatives on Kirkuk. The first alternative involves holding a vote using the 2009 registers, to be followed by a scrutiny of those registers within one year to find whether there are irregularities amounting to more than 38% “in the registers” (a little unclear what the percentage really refers to, given as واذا كان هناك خلل بنسبة 38% في السجل يتم الغاء نتائج) in which case the annulment of the result will follow. The second alternative is another creative multi-constituency arrangement. Once more, an explicit ethno-sectarian distribution formula has been avoided, even if three of the four proposed constituencies seem intended to guarantee some kind of minimum communal representation: Hawija, Taza and Shwan will each have three deputies (apparently aimed at Arab, Turkmen and Kurdish constituencies) whereas Kirkuk itself will remain fully competitive with 5 representatives. This seems to over-represent the peripheral constituencies to a certain extent over Kirkuk, but the proposal has the clear advantage of keeping the potential for cross-sectarian voting in Kirkuk alive, while at the same time apparently offering each of the main communities a minimum fallback position in their areas of demographic concentration. In the case of the Turkmens it is particularly easy to sympathise with this approach: As a medium-sized minority they are in many ways the bravest of the Iraqi nationalists since they so far have been competing without guaranteed quotas of the kind offered to the micro-minorities (Shabak, Yazidis, Christians, Sabaeans), and also without a de facto guaranteed minimum vote in bastions of governorate-level territorial concentration (of the kind enjoyed by the Shiite and Sunni Arabs and the Kurds). All in all, while both of these options do preserve a special status for Kirkuk, the first one seems highly diluted given the high threshold for annulling elections (if correctly specified in the official report from today’s proceedings). One can get the impression that the second one could conceivably have greater appeal to Iraqi nationalists. Be that is at may, the rapidity with which the Iraqi parliament seemed to accept today’s highhanded intervention by the IHEC is quite shocking. The Sadrist Fawzi Ikram Tarazi, himself a Turkmen, has been one of the few parliamentarians to protest to the Iraqi press so far, suggesting that at least some of the non-Kurdish members of the legal committee would be more than happy to see endless procrastination and a reversion to the closed-list system of 2005 by way of timeout. In this they are ably assisted by the Kurds, who appear to receive full support from UNAMI and IHEC in torpedoing any proposal that does not conform one hundred per cent to their own preferences. In the first place, this is a flagrant and remarkably public interference in Iraqi affairs of a kind not seen since the Bush days (and the 2003–2005 period in particular). Secondly, the statement really is quite hard to decipher! The first sentence and the first part of the subsequent one seems to suggest that this election law should be unique to the January 2010 elections, thereby presumably opening space for special treatment of Kirkuk (the Kurds want it to be treated as an ordinary governorate; if that procedure had been acceptable to others and therefore was adopted there would have been no need to restrict the application of the law to 2010 as per the Odierno/Hill recommendation). The second part of the second sentences raises doubts, however. One would expect the logic to continue to flow in a consistent fashion, i.e. a reassurance to the Kurds that any special arrangements arrived at for Kirkuk should not prejudge the outcome of future negotiations over the city (the Kurds want to keep article 140 of the constitution sacred). But is that what is being said? After all, the standard argument by the Kurds and UNAMI has been roughly “the election law should not serve as diversion or substitute for political settlements related to Article 140, demographic change, disputed boundaries, or other contested issues”. But the American statement clearly says “precedents”, which seems to create the exact opposite logic, i.e. a rather indiscreet American initiative to convince the Kurds to be more accommodating. So far, the PUK has published the statement on its website without adding any comment. What Exactly Is UNAMI Up To in the Iraqi Parliament? Claims and counterclaims have abounded for a couple of days with regard to the fate of the election law in the Iraqi parliament. In the early hours yesterday it seemed there was consensus on a package with a limited number of alternatives that could easily be voted on; however during the course of the day it became clear that this deal had in fact disintegrated. Today, there is once more talk of tomorrow (Thursday) as the decisive day for a vote, but so far there is no news about any new draft that is ready for submission to the full assembly of the Iraqi parliament. One of the remarkable aspects about yesterday’s developments is that the UN’s agency in Iraq, UNAMI, appears to have played a key role in derailing a deal that was in the making. In the early hours of the morning, a press statement was released by the Iraqi government to the effect that the “tri-lateral meeting of the presidents” (this time referring not to the presidency council but the three “presidents” (ru’asa’), i.e. Maliki for the council of ministers, Talabani for the presidency, and Samarraie for the parliament) had agreed on a “limited” draft of the election law. But around midday the parliamentary proceedings began, featuring among other things a meeting where UNAMI and representatives of the elections commission were present. And whereas this external presence has totally drowned in Western news reports on the developments (where the Iraqis are invariably blamed for the failure), remarks by some Iraqi politicians make it perfectly clear that UNAMI had indeed tried to shoot down at least two and possibly all the three alternatives for Kirkuk that had emerged earlier in the week during the meeting of the political assembly for national security. Referring to “technical problems”, UNAMI rejected one of the more innovative proposals on the table, which apparently originated from ISCI’s Adil Abd al-Mahdi and therefore also constituted something that should have a greater chance of being accepted by the Kurds: The idea of subdividing the city into two constituencies, not on the basis of sect or ethnicity but instead with reference to residency status. This seems like an elegant proposal that would differentiate between long-established residents of Kirkuk on the one hand and recent arrivals and more fictitious “residents” on the other, thereby creating space for Kirkuk identity without tying it to any specific and wider ethnicity other than “Iraqi”. Instead, UNAMI reportedly objected on technical grounds and advocated the adoption of the solution that is only favoured by the two Kurdish parties, i.e. relying on the 2009 registers of voters, perhaps with some kind of extra scrutiny across the country, but without any special treatment for Kirkuk. This is what it looks like at the surface. There may well be other explanations, but as long as UNAMI remains so uncommunicative about its activities in Iraq, it is really difficult to tell. And, in fact, the few UNAMI press releases that exist on this topic seem to suggest that the UN sometimes fails to appreciate the extent to which politics in Iraq has changed since the current constitution was adopted under chaotic circumstances back in October 2005. For example, in a statement to the press on 21 October, Ad Melkert, the new boss of UNAMI (who arrived in Baghdad only this summer), commented on the elections law as follows: “It is equally important that Iraqi parliamentarians recognize that the focus should remain on the national process and overcome any narrow considerations that could be the source of the current stalemate.” The reference to “narrow considerations” in that context seem pretty clear: It refers to the demand by a large number of Iraqi parliamentarians for special treatment of Kirkuk. This is a perfectly logical demand for a more level playing field, given that Kirkuk is the only Iraqi governorate to have experienced large-scale demographic changes in the post-2003 period with the specific aim of changing its political status (and annexing it to Kurdistan). Moreover it is emphatically a national issue, and not something that can be plausibly reduced to “narrow considerations” and the “obstinate” demands of Arabs and Turkmens native to Kirkuk, as UNAMI (and some Iraqi politicians) like to think. To many Iraqis, Kirkuk, with its multi-ethnic nature, is the real heart of Iraq, and to dismiss the issue as a local problem, as UNAMI seems to do, is simply an insult to Iraqi national sentiment. In fact, whereas the political council for national security produced three options that all studiously avoided the concept of ethno-sectarian quotas (which would only reify ethnic divisions), UNAMI’s only known proposal that even considered special arrangements in Kirkuk reportedly followed precisely that kind of narrow quota logic – apparently oblivious to the fact that the Iraqi federal supreme court many months ago rejected this approach as unconstitutional. Does UNAMI really believe Kirkuk is a perfectly ordinary Iraqi governorate and that all that has happened there after 2003 is irrelevant? On the whole, whereas pre-2003 injustices are amply covered in the TAL of 2004 and the constitution, problems in the post-2003 period are inadequately addressed and this should not be glossed over by the international community. This is not the first time UNAMI intervenes in the Iraqi political process in a rather abrupt manner. It has already tried to instruct the Iraqi parliament to keep the current line-up of the elections commission, saying any changes would mean technical problems and delays. Previously, during the reign of Staffan de Mistura, UNAMI was busy proposing detailed arrangements for “disputed territories” in the north. 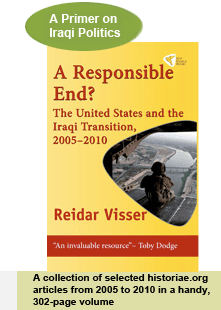 What seems to be lacking is an appreciation of the growing tendency among Iraqi politicians to see the 2005 constitution as a framework for a process rather than an eternal truth that should be approached in a scriptural fashion. Even Prime Minister Nuri al-Maliki has bravely described the circumstances in which the constitution was adopted as desperate and chaotic, thereby highlighting the special provisions for a one-off constitutional revision where everything is up for negotiation. Despite this reality, UNAMI staff keep approaching concepts such as federalism and disputed territories much in the way they were understood by the alliance of PUK/KDP and ISCI which introduced them during the hectic summer of 2005. What we are dealing with in the case of Kirkuk is a governorate where there are allegations of systematic institutionalised fraud (aimed at changing the political status of the governorate) even before the voting process gets going. This makes Kirkuk into a unique case in Iraq, but also a case in which the whole country has an interest. So when comments by Iraqi politicians leave the impression that UNAMI actually overrode proposals on Kirkuk by the triumvirate of Maliki/Talabani/Samarraie – a collection of individuals among whom consensus is normally in short supply – then some further public clarification of the UN role is the very least Iraqis can ask for. UNAMI and the elections commission are supposed to offer assistance to the evolving democratic institutions in Iraq and to be their servants – not the other way around. The proposed solutions for Kirkuk may not satisfy the UN technical experts in every possible way, but they seem to reflect a growing consensus in the Iraqi parliament on an election law that features both open lists as well as some kind of special status for Kirkuk. The latest rumours suggest that at least one of the original proposals on Kirkuk (probably the one involving the 2004 registers) will be included as an alternative in the bill that hopefully will be voted on tomorrow. After the announcement last week of the Unity of Iraq Alliance, it has been a dizzying period for the remaining nationalist parties that are still trying to form some kind of large-scale coalition and/or considering joining either the Unity of Iraq Alliance or Maliki’s State of Law. All the logically possible combinations have by now been exhausted more than once in press reports, so it was perhaps to be expected that the first step with some substance to it took place in the darkness of night yesterday, in decidedly low-key style. It consisted not of the announcement of another big alliance, but simply of a press release from the Wifaq movement of Ayad Allawi to the effect that it had joined with the Hiwar movement of Salih al-Mutlak to form a new entity, called the Iraqi Nationalist Movement. The new movement (haraka) is referred to sometimes as a “party” (hizb) or “organisation” (tashkil), but is apparently not reckoned as an “alliance” yet, meaning negotiations with others are still going on – and may well continue until the expiry of the deadline for forming coalitions. “Others” in this case means above all Usama al-Nujayfi who is affiliated with the powerful Hadba movement of Mosul, but to some extent also Tariq al-Hashemi (who has broken away from the Tawafuq bloc, a more Sunni-oriented entity) as well as Rafi al-Isawi (the deputy premier, also a Sunni). Interestingly, the objections against the two latter individuals joining the alliance appear to have come above all from leaders in the Hiwar movement, who reject the way Hashemi and Isawi have been “playing the game of sectarianism and quotas [muhasasa]” by accepting high offices in the Maliki government in what critics say amounts to roles as Sunni figureheads. Some of that criticism seems easy to understand, even if Hashemi at times has been a robust critic of the system “from within”. Hiwar, for its part, has been a prominent player in the 22 July front that has driven forward many of the important changes in Iraqi politics over the past year – such as demanding local elections on time and focusing on Kirkuk as an issue of national significance. Also Iraqiyya, especially since it left the Maliki government in August 2007, has increasingly contributed to this nationalist opposition which played a key role in changing the climate in Iraqi politics (and to some extent created space for the more nationalism-oriented Maliki to emerge in 2008). Against that background, the by far most important omission from the line-up is Nujayfi, whose Hadba movement totally overshadowed all the other nationalist parties in Mosul during the last local elections. In American discourse on Iraq, Anbar is often seen as the key to the “Sunni scene”, but Hiwar and Iraqiya probably realise that there is more to lose in Mosul, which historically is home to many of the important nationalist movements in Iraq. Some will say that a simple merger of Wifaq/Iraqiyya and Hiwar was the very minimum a secular and nationalist Iraqi voter could ask for. That is true, but it is nevertheless important in itself that such an act of consolidation did take place, especially given the hopeless fragmentation of these forces during the previous elections in 2005. Back then, under adverse circumstances, the two managed to win altogether 34 parliamentarians; last January they won 45 councillors across Iraq from Basra to Ramadi. But with the emerging dynamic of perhaps five medium-sized blocs (The Kurds, the Iraqi National Alliance, the State of Law, the Unity of Iraq Alliance, and most recently the Iraqi Nationalist Movement with or without Nujayfi and friends) we could be headed towards a parliament with no clear winners. Right now no list looks like an obvious potential winner in the way that for example a Maliki/Nujayfi ticket or Allawi/Mutlak/Bulani/Abu Risha would. Competing prime-ministerial ambitions may prevent such alliances from taking place, but the net outcome of a failure to coalesce could be that many of these parties gain no power at all. Which is something to think about as the coalition deadline of 31 October comes closer. The outcome of yesterday’s meeting in the political council for national security devoted to the stalemate on the elections law appears surprisingly positive, at least if statements by the Hiwar parliamentarian Muhammad Tamim to the Sumaria television station can be taken at face value. According to Tamim, three alternatives for Kirkuk were discussed. The first involves a reversion to the electoral registers of 2004, which predate controversial increases in the numbers of voters that took place in 2005. The second alternative would reportedly divide Kirkuk into two electoral districts; crucially, however, this would not be on the basis of ethnic or sectarian identity. Rather, a distinction would be made apparently between voters who actually live in Kirkuk and those that are just registered there – and the results from the second constituency would count towards the so-called “national” (compensatory) seats that account for 10 to 20% of the seats in the Iraqi parliament and are awarded during the counting process to provide greater proportionality at the national level (Tamim in this case simply distinguishes between min sukan Kirkuk and min ghayr sukan Kirkuk). Finally, the third alternative would postpone elections in Kirkuk until the elections registers have been carefully scrutinised. In sum, here are three compromise alternatives for Kirkuk that all eminently mediate between the original bargaining positions. None of the proposed options would in any way enshrine ethnic divisions in the city. The main worry now relates to the conflicting stories about what should happen next. According to Tamim, the Iraqi presidency, on the basis of yesterday’s deliberations, will have the job of presenting a consensus package to parliament for a vote. However, Ayman al-Asadi, another parliamentarian, talked about sub-committees and more meetings in the political council for national security, something that could easily drag on for a long time. Yesterday’s terror attacks in the heart of Baghdad mean that there is increasing tension in Iraqi politics and a greater need than ever to agree on an electoral law. With the emergence of three sound alternatives for Kirkuk there really is no excuse for Iraqi politicians to postpone this process any further. The significance of the Unity of Iraq Alliance announced today is that it forms yet another second-generation alliance in Iraq’s post-2003 politics, based on participation by politicians from various sects and ethnicities on an equal basis and connected through certain common (if in this case yet understated) ideological preferences. After the formation of Nuri al-Maliki’s State of Law coalition on 1 October, this is the second major cross-sectarian electoral coalition to emerge in the run-up to the January 2010 parliamentary elections… Full story here. Ayad al-Samarraie has issued a statement to the effect that the search for consensus solutions to the crisis over what to do with Kirkuk in the elections law has not yielded any results and that parliament will not meet again until Sunday. Some press reports indicate an agreement to involve the so-called “political assembly for national security”, which is basically another closed-door gathering of the leaders of the biggest political parties that dates back to the sectarian atmosphere of June 2006, and whose constitutional status is unclear. Attempts by UNAMI to intervene have so far failed to produce any results, and if stories about a proposed 51/49 per cent Kurdish/non-Kurdish quota-sharing agreement for Kirkuk are indeed correct (as reported by Sharqiyya television, among others) then they are also headed in the wrong direction: this would enshrine ethnic divisions instead of exploiting the considerable potential for inter-ethnic dialogue that exists at the grassroots level in Kirkuk, where many Kurds are fed up with their political leaderships. Meanwhile, the Iraqi elections commission has reportedly extended the deadline for forming coalitions (which originally expired today) also until Sunday 25 October. There is now major pressure on the “third way” forces of Iraqi politics to come up with something material in this respect. Last week’s re-launch of the Tawafuq bloc seemed unimpressive, sectarian and rather confirmed its isolation, and the long list of small parties added to Iraqiyya contained mostly the usual suspects whose prospects as standalone entities are highly limited. There is much talk of the imminent establishment of some kind of front involving those “in the middle” but so far few concrete results except the Bulani–Abu Risha alliance which has already existed for some weeks (and which today reportedly had a string of new members, including Abd al-Ghaffur al-Samarraie, a prominent Sunni cleric, added as part of a formal launch under the name Unity of Iraq Alliance). A headline by an Iraqi newswire service this morning spelt out the problem: “The parliament will keep searching for a solution on Kirkuk until a consensus position is arrived at”. And search they did, for a couple of hours at least, until Iraqi parliamentarians in predictable fashion called it a day again in the early afternoon. But actually, a consensus solution is not required. Either Iraqi parliamentarians have a very short memory, or they are in fact making up new rules and establishing preferential treatment for the representatives of certain parties. For example, on 11 October 2006 one of the most fateful decisions in Iraq’s post-2003 history was made when parliament adopted the law for the formation of federal regions in a situation where almost half the assembly boycotted the vote and until this day it remains unclear whether the quorum threshold was actually met. Similarly, on 19 April this year, Ayyad al-Samarrai was adopted as new speaker against 79 votes that were either blank or in favour of his challenger. On both occasions, large segments of the Iraqi parliament failed to have it their way – and gracefully accepted the result. So why cannot the same method be used for the elections law, where it is possible to vote article by article on the alternatives that are already defined? True, the two biggest Kurdish parties are threatening to march out if any proposal that is at the slightest variance with their own view is even presented for a vote. But is there really any difference from 11 October 2006, when the Kurdish parties remained in the assembly and happily adopted the federalism law with half the parliament absent in boycott? In fact, in contrast to the situation in 2006, in this case those who want to go ahead with the vote have actually presented a range of compromise alternatives that should be attractive to the Kurds if they would only look at them with new eyes – including revisiting the electoral registers of Kirkuk, establishing a special committee to look into the issue, or a separate elections law for the Tamim governorate. So far, the nationalist Hiwar bloc and Izz al-Din al-Dawla, an independent from Mosul, have been at the forefront of the calls to hold a vote. The Daawa party, too, has seemed more eager than others to move the process forward together with their independent allies (such as Khalid al-Atiyya, who actually tried to hold a second session yesterday afternoon without achieving a quorum), whereas ISCI and Jalal al-Din al-Saghir in particular have been central to the attempts to delay a vote until there is a consensus, thereby taking a position reminiscent of their old alliance with the Kurds (Sami al-Askari of the Daawa openly accused members of the ISCI-led Iraqi National Alliance of deliberately staying away from today’s session) . Yesterday, Saghir reproached Ali al-Adib of the Daawa for wanting to press ahead with a vote, saying this would prompt a presidential veto by Jalal Talabani. That could of course happen, but, as the Sadrist Baha al-Aaraji put it earlier, Talabani would then have to choose between being the president of Iraq or the president of Kurdish alliance. Iraq’s political system as defined by the 2005 constitution is already overcharged with checks and balances to the point where government has entered a state of paralysis. The inhabitants of a country that is one of the world’s most important energy suppliers are still facing poor standards of living because their politicians keep searching for elusive consensus. It’s enough consensus and time for a vote. Mahmud Uthman of the Kurdish bloc wanted to press on with more important matters and Jalal al-Din al-Saghir of ISCI thought the elections law should be studied in a smaller group to achieve consensus. Today’s session of the Iraqi parliament ended pathetically with the endorsement of a handful of new Iraqi ambassadors who were goaded through the ritual of reading out their CVs and then confirmed by acclamation – no doubt after having already been approved by studious adherence to the principle of ethno-sectarian and party quotas in a way that would have made Paul Bremer proud. The obvious alternative of simply voting on the elections law, article by article, apparently did not appeal to the powerful voices in the assembly. Instead there is another delay and another session tomorrow. And the clock is ticking. The Norwegian newspaper Dagens Næringsliv (DN) has continued its investigations concerning the multiple roles of US former diplomat Peter Galbraith in Kurdistan in the period 2004–2008. So far, this has been confirmed as involving simultaneous business interests in the Tawke oil field, consultancy for the Kurdish regional authorities in the Iraqi constitutional process, and loud advocacy of a partition of Iraq as a policy alternative for the United States. Today, a fourth dimension has been added through the confirmation that Galbraith was also a paid consultant for the Norwegian oil company DNO. DN has today revealed that in the period from May to November 2004, Galbraith received at least GBP 125,000 (USD 200,000) from DNO through the London-based company Pinemont Securities as payment for consultancy work. The information is based on company records and accounts. Attempts by the newspaper to obtain further comments from Galbraith were unsuccessful. Pinemont was owned by Endre Røsjø, a Norwegian investor and prominent advocate of investment in Kurdistan who himself at times did consultancy work for DNO and has recently been identified as a previous stakeholder in the Tawke PSA, possibly the five per-cent share currently claimed by a Yemeni businessman. The significance of the new information is that it emphasises once more the multi-faceted nature of Galbraith’s involvement in Iraq. Earlier revelations have shown that Galbraith through his Porcupine company had obtained a business interest in the Tawke oil field, but it remains unclear exactly how he became a stakeholder, and in particular whether his share was primarily a reward from DNO, the Kurdish regional authorities, or both. The new information makes it clear that Galbraith was considered vital enough for DNO to be hired as a well-paid consultant. This in turn highlights the question of whether Galbraith was really serving Kurdish interests or Western investors. Of course, Galbraith has openly declared that his actions benefited both, and this is also the official line of the two dominant Kurdish parties, who pursue a pro-investment policy towards foreign companies. However, the renewed focus on Galbraith’s dealings – and especially the confirmation that he was also a paid consultant of oil companies investing in Kurdistan – should give occasion to increased scrutiny of the way he influenced the Kurdish stance on oil issues towards a position that gradually became ever more irreconcilable towards Baghdad. In particular, there is a stark contrast between the approach to oil as reflected in the draft constitution prepared by the Kurdistan Democratic Party (KDP) in the 1990s and confirmed in 2002 – where the administration of the oil sector is the exclusive prerogative of Baghdad, full stop – and the ideas about local control of oil as articulated in the “Special Provisions for the Kurdistan Region of Iraq”, authored by Galbraith less than two years later. More broadly speaking, whereas early Kurdish constitutional proposals around 2003 ultimately aimed at coexistence (even if the they involved some pretty tough bargaining positions), Galbraith saw the 2005 constitution, to which he contributed, primarily as an instrument for the controlled dismantling of Iraq (“the constitution is an Iraqi solution to an Iraqi problem…The Kurds and Shiites concluded that Iraq cannot function as a single state and have worked out arrangements to divide it amicably”). Today, Kurdish interests are suffering from the maximalism and contradictive policy stances that resulted from this process of radicalisation. This is seen above all in the oil sector, where the involvement of foreigners like Galbraith has created a certain Klondike mentality and unrealistic expectations in a regional administration that has very limited experience with the energy sector historically. This in turn has alienated it from Baghdad and created an impasse in negotiations about how to proceed with exports from fields that involve foreign companies. Over the weekend, Asri Musa of the Iraqi oil ministry in Baghdad repeated its standard position that it cannot pay the foreign companies involved in Kurdistan since it does not recognise their contracts. While the foreign companies need money and now have started to sell the oil locally instead, Baghdad is more focused on progress in its technical-service contracts with foreign companies for the supergiant fields in the far south, like Rumayla (which dwarf the Kurdish fields in terms of production potential: the contract for Rumayla involves a production boost from 1 million to 2,9 million barrels per day, for example). Additionally, technical service contracts are a lot less controversial among ordinary Iraqis than are the PSA contracts in Kurdistan, reflecting yet another example of how Galbraith’s “consultancies” have actually served to drive a wedge between the two biggest Kurdish parties and the rest of Iraq. The leading pan-Arab daily Al-Hayat is already using the term “Tawke-gate” for the Galbraith saga. Iraqis who know their history are pointing out the obvious parallels to Calouste Gulbenkian, the Armenian also known as “Mr. Five Per Cent” for the personal shares he obtained in exploitative contracts that gave Western companies a foothold in Middle Eastern oil, including in the Iraq Petroleum Company, in the early twentieth century. “Oil for Consultancy” screams a headline in today’s Al-Bayyina, a newspaper affiliated with “Hizbollah in Iraq” which is a part of the new Shiite-led alliance in Iraq. If President Obama’s administration is to improve its credibility in the Arab and Islamic worlds, it is issues like that of Galbraith’s dubious involvement in Iraq that require crystal clear positions.